Choosing an auto glass company is not something that is taught, but is something that most people will have to go through at least once in life. Friends and family may share information about doctors, dentists and lawyers to help you decide, but choosing a company to repair or replace your broken auto glass can be a helpless experience. PG Sylmar auto glass repair takes the work out of finding a quality and trusted company by providing 24/7 immediate service. Scenarios that involve broken auto glass are complicated for families with children. Being stranded in the hot summer sun can be dangerous to every occupant sitting inside of an automobile. Calling for a tow truck only moves your automobile to a safer place and does not solve the original problem. PG Sylmar auto glass repair technicians arrive quickly to repair or replace damaged auto glass to get your automobile back on its journey. A car or truck that is used for personal or business traveling has the same problem when glass damages occur. The ability to drive safely and accurately is severely disturbed. California laws do not permit a person to drive a car with severe damage and a busted window violates these laws. PG auto glass repair in Sylmar dispatches specialists to examine, quote and replace your glass using fully stocked mobile auto glass vehicles. The best auto glass companies use replacement glass certified by every automaker for quality and durability. Anything less is a safety hazard when your auto windows need replaced. Technicians need more than tools to replace sunroofs, tinted and windshield glass. PG auto glass repair in Sylmar uses OE replacement glass for every window install to maximize your safety. City vehicles, state service trucks and public school buses depend on durable and damage-free windows during transportation. 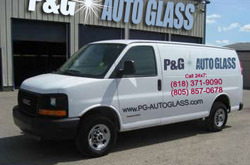 PG auto glass replacement in Sylmar services these vehicles and provides a lifetime guarantee for installation. There is no substitute for the right way to replace broken glass. PG Sylmar auto glass replacement technicians rely on experience, safety and training. Are you searching for a trusted source of auto glass repair in Sylmar, CA in zip codes 91342 or 91392? Contact PG Auto Glass for all you repair and replacement needs.